At political conference, former Defense Minister says Israel Resilience-Telem want to head the next government, give Israel a better future. 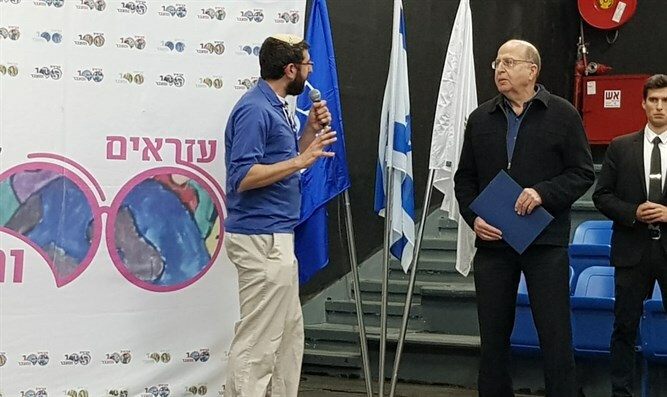 Politicians from the right and the left participated on Sunday in a joint election conference of the Youth Movement of the Agricultural Union and the Ezra Youth Movement. "In the media there is more complexity, the cases [involving Netanyahu] are connected to the media, and the whole thing is about integrity and modesty. When I resigned [as Defense Minister], I reached the conclusion that I could influence and so I called for alliances. Therefore, we are running with Benny Gantz and the agenda is the slogan 'Israel comes first,' because the division between right and left is irrelevant," continued Ya’alon. "We want to form the next coalition and we want to be an alternative in order to provide a good future for the State of Israel," stressed the former defense minister. MK Revital Swid (Labor) also took part in the conference and said that she is unfazed by the bleak polls predicting a low number of seats for her party. "The polls are not everything and our strengthening will continue. What happened to us? It was all because of Gantz's speech and the fact that people want change. If you want the same rule then how do you vote for Gantz? Those who are not on the right have no party other than Labor, because within the Israel Resilience party there are wonderful people, but they are proponents of the entire land of Israel, they are in favor of annexing and transferring money to the territories, and those who support Labor cannot vote for them. We have responsibilities, mistakes were made because the Labor party has an entire agenda, and when our leader isn’t appointed prime minister we replace the chairman, and that hurts us,” she said. "The other parties have replaced very few leaders, and this is something we have to pay attention to, it created backstabbing within the party, and that is what hurt us. We have a new team and we are all behind [Avi] Gabbay and hope that we will form the next government." "Is there anyone in the Likud who cares about the social side? Show me a social-security party on the right. I have an unequivocal position in the security field, but we have lost the responsibility of bringing people together and making them a part of our society. Yair Lapid tried to help but ultimately destroyed by forcing the haredim to enlist in the IDF. There are citizens who are like us in the Arab society as well,” said Hirsch.